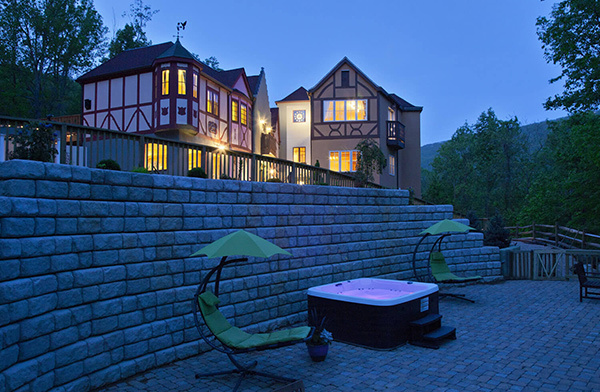 Nestled between the Blue Ridge Parkway and Wintergreen Mountain, the Fenton Inn is a Charming Bavarian Village that combines the best of Old World craftsmanship and modern luxuries. We have a variety of different suites that can accommodate romantic couples as well as the entire family. Start each day with delicious complimentary breakfast buffet in our quaint Bakery. Complimentary WIFI available. The Fenton Inn can also host meetings for up to 50 people in our elegant ball room. We are located just 0.3 miles from Wintergreen Resort entrance and 0.5 miles from the Blue Ridge Parkway and Appalachian Trail at Reeds Gap.